Hello loyal fans, followers, TV and Radio addicts. It is with great regret that I’m putting a pause on the guide for a couple of weeks until the exam / coursework rush is out the way. Right, so I promised a normal post this week, however, it is the week of the school show, there is a lot of marking to be done and I’m up to my ears in researchEd programmes. There is a slight technical issue which means the guide cannot be posted tonight – I will aim to post tomorrow evening. Here’s the guide – sorry for no accompanying information this week. Service back to normal next week. We’re having a break for the 2 week holiday. Will post the guide again Sunday 12th April – hope you all have a pleasant break. The clocks go forward on Sunday so here’s Stephen Fry on why we do it. Plenty to choose from this week, including Episode 2 of Jim Al-Khalili’s excellent Chemistry series, and Michael Mosley investigating his own blood. Starting the week off are two programmes about the desperate straits we are getting into with antibiotics. Then Quentin Cooper looks at Capturing Light with three guests. In Our Time is a biography of the Curies and there is a programme from Radio Ulster about pioneering astronomer and solar photographer Annie Maunder. Stephen Fry has two programmes on the radio on Saturday, one about the Millenium Bug and the explaining Daylight Savings. And of course, Inside Science. There will be a two week guide break over Easter – I will post anything that looks really interesting on the @scienceTVRadio twitter feed. 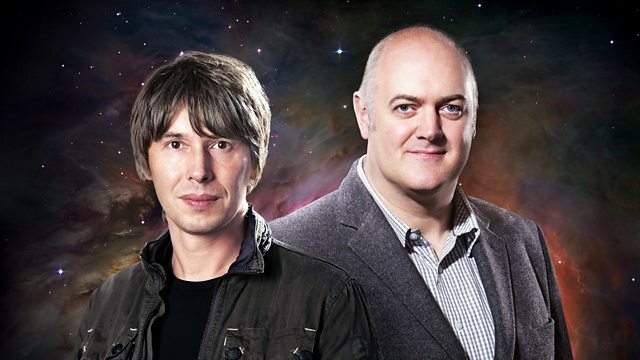 Dara O’Briain and Brian Cox – hosting a live broadcast of Star Gazing Live during the Solar Eclipse on Friday morning. Star gazing Live is back this week – covering the eclipse as well as the Rosetta mission with Matt Taylor and manned space exploration with Buzz Aldrin. Try to organise something in your school if you can – even if it is just watching the live video feed from the Faroe Islands (which is where the umbra will fall during totality). The UK will be treated to about 90% totality (we will lie in the penumbra). The Life Scientific with Rosetta scientist Matt Taylor who is also on Star Gazing on Thursday. Please excuse the short post and enjoy this week’s Science TV and Radio. There is a lot on this week – I’ve had to drop the podcasts list. I hate doing this but I’m going to take a raincheck from the TV guide this week. I have a very busy week ahead and the overhead of preparing the TV and Radio Guide is just too great. and of course: Inside Science on Thursday. If I see any more I’ll update the post and tweet the links. My apologies to your students. Back next week.